This blog is to let out my creative energy. I love party planning, crafts, invitations, recipes, menu planning and just giving and getting ideas from people. My father, George Manousos, came by boat, to this country from Andros, Greece in 1923. He was a 17 year old illegal immigrant who didn't speak of word of English. He joined the US Army during World War II to not only fight for his country, but become an American citizen. While he was stationed in England, he meet Anne Milne and they fell in love. She moved to America and they married in December 1946. I grew up in a neighborhood of immigrants. We had Greeks, Italians, Scots, Norwegians and more. My Mom tried all their recipes. Here is one of my favorite Greek recipes that I grew up with. 1. Drain the moisture from the spinach. 2. Gently fry scallions in oil until soft and add oil and onions to spinach. 4. Lightly oil a 13x9 pan. 5. Line dish with 10 sheets of filo pastry, brushing each sheet with oil. 6. Add spinach filling and spread evenly. 7. Place remainder of the filo on top, brushing each sheet with oil. 8. Trim excess filo pastry. 9. Brush top with oil and bake for about 45 minutes. 10. Remove from oven and let stand for 5 minutes before cutting into squares. I love to serve Spanakopita with a big Greek salad. Hope you enjoy it as much a my friends, family and I do! Hey That's My Luggage, Tag! Who hasn't been to the airport and found 5 bags on the carousel just like ours? 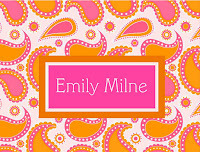 Well I decided that I would make myself a colorful luggage tag that you could see a mile away. It became such a big hit with my friends (and strangers at the airport) that I put them on my website. These are great for luggage, backpacks, diaper bags and more. I'm always looking for easy but delicious recipes to make. I find the older I get the less I want to spend hours in the kitchen. I remember years ago cooking elaborate, time consuming recipes with joy. Now I get annoyed when I have to wait 20 minutes for the rice to cook. A friend of mine, who like me used to love to spend time in the kitchen, gave me this recipe. It is so delicious and easy that people will think you spent hours in the kitchen. And isn't that what really matters? Serve with rice, a vegetable and salad and you're good to go. 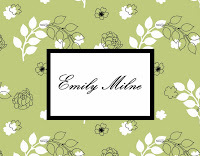 In the name of shameless self promotion, I present to you my newest designs for note cards at InvitetheParty.com. 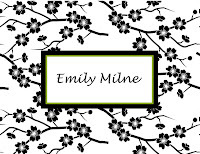 My personalized note cards come in a cellophane bag with a matching ribbon. 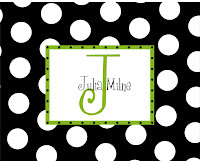 These are perfect for teachers gifts, birthday presents, wedding shower or baby shower gifts. Can't see what you want, just ask and I can create it for you. I got my usual Better Homes and Garden email today and I just had to share some of their ideas about a DYI Beach Wedding. I wish I could take credit for them, but sadly I can't. 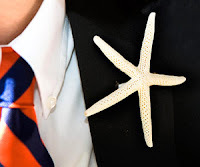 I just love the starfish boutonniere! All you need to do is glue a pinback to a starfish. What could be easier and more inexpensive. 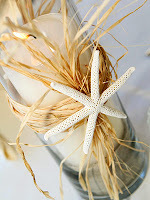 Who wouldn't love the simplicity and elegance of a candle holder decorated with raffia and a starfish. 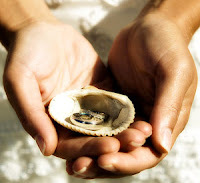 How cute is the ring in a shell instead of a pillow? Anyway, check out their ideas they are really great! Hmm . . . . maybe I'll have to marry my husband again just so I can use some of these ideas? 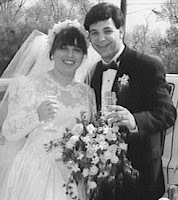 Perhaps for our 20th. That gives me 5 more years to butter him up. Check out the ideas on BHG for yourself, you won't be disappointed. I was looking for one of my tried and true dessert recipes for a party the other day. As I've stated previously, I am not a baker. My ADD brain just don't enjoy having to be so precise. 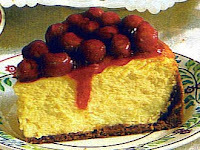 What I have done over time is find a couple of great dessert recipes that keep people coming back for more. So here is one of the best. Please note that if you are looking for a diet dessert, quickly click out of this page. By just reading the ingredients, you will gain at least a pound. CRUST: Position oven rack in lower-third of oven; preheat oven to 350 degrees. Butter 9" springform pan. Combine graham cracker crumbs, butter and sugar; press into bottom and 2" up side of pan. Bake 10 minutes or until golden; remove from oven. CAKE: Increase oven temperature to 500 degrees. At medium speed beat cream cheese until fluffy, about 4 minutes. At medium-low speed gradually beat in sugar. Beat in flour, vanilla and zest. At low speed beat in eggs and yolks, one at a time, until combined. Beat in sour cream. Pour batter into crust. Bake 8-10 minutes or until golden and edge is beginning to rise; reduce oven temperature to 200 degrees. Bake 1 hour. Turn off oven; leave cheesecake in oven without opening door (this is the hardest for me) for 20 minutes. Cool in pan on rack 30 minutes. Run small spatula around edge of cake to loosen. Refrigerate until completely cooled, at least 4 hours. Remove side from pan; transfer to serving plate. Top with pie filling. Note: I don't know if this is really true, but I do it anyway. Someone told me to place a pan of water on a rack under the cheesecake rack while it's baking. It is supposed to keep the cheesecake from cracking to much because it adds moisture to the baking. Again, I really don't know if this is true, but that's what I do. 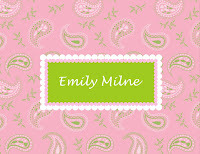 Looking for unique personalized invitations, stationery, candy wrappers, luggage tags and more? www.invitetheparty.com is the place you've been looking for. 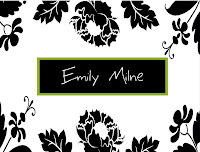 I am an invitation designer who owns an online business called invitetheparty.com. I started this so that I could do my own designs. I love the process of design. From the initial conception to the look on the customers face when it is completed. I also, love the creative process of putting a party together. For years, people have told me to go into the party business. Quite honestly I have two children and would not want to take the time away from them. So instead I plan fabulous parties for them and help friends plan their own parties. My other love is charity work. I am a Girl Scout Leader, President of a local chapter of the Junior Woman's Club (not to be confused with the Junior League) and through those organizations set out to help at least our little corner of the world.